Hello. I am relatively new to Creo and I need help with my model. My projects is to make a CAD model of a masku that I want CNC cut and put up on my wall at home. At the moment my model looks like this. 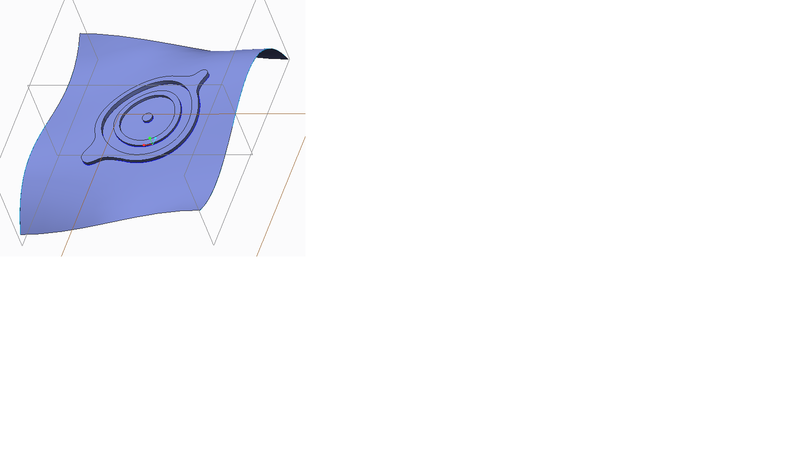 I have sketched some curves and made surfaces between them. Then I sketched the contours of the mask's eyes and lines, etc on a plane and projected them down on the surfaces. 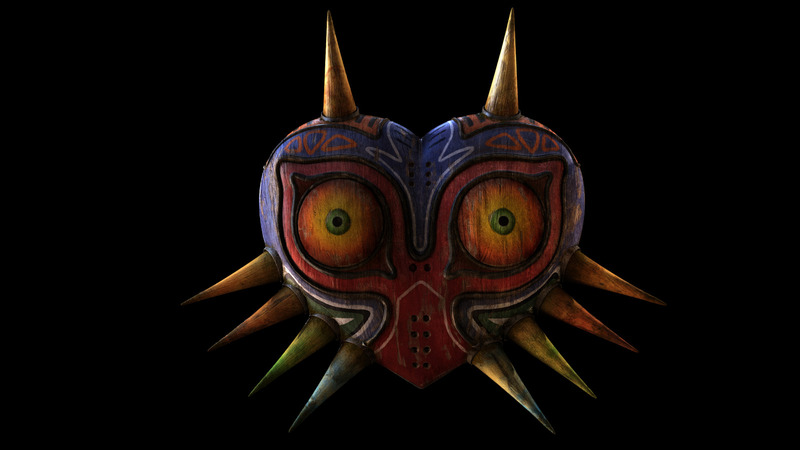 My question is now; how do I get these contours, say the pupils, to have an offset/be above the main surface of the mask/ "higher" up? (I need these contour changes so the CNC machine can pick them up). This is the perfect place for these questions. It is just a little quiet around here on the weekends. Would love to see what you come up with when you are done. Please share the process in a document or blog. 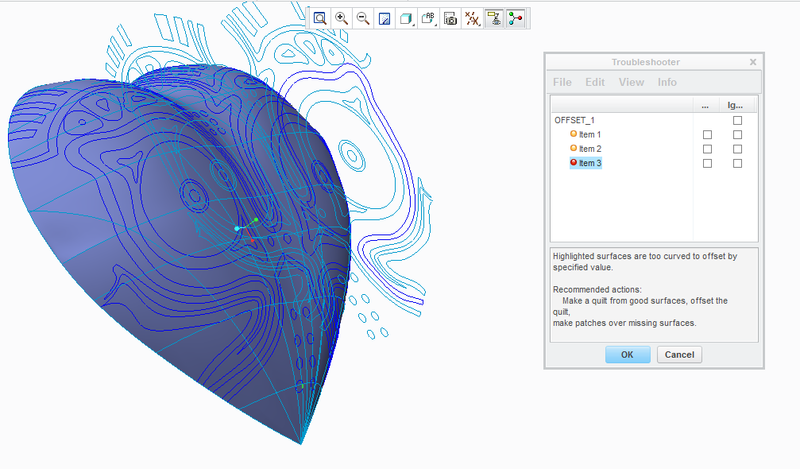 ...and if you want more controlled contours, of course you still have the trim and merge options. In that case, you will want to learn about variable section sweeps... or VSS. Another very powerful tool but requires a little research to make the most of it. A search for VSS in the forum will bring up a lot of information. This will be useful in joining some of the protrusion features to the surface. I have looked more into the offset button and seen some videos of how to use it, and I am definitely getting closer! I did a test in another document and it went well as you can see. The other errors are typically "geometry could not be constructed" etc.. Seems like there is something the matter with my surfaces, since i can only get to offset the the eye circles and nostrils.. Unfortunately, this is a very sensitive command. 1st of all, You might extend the edges of the primary surface so you are not trying to deform the edge. This can be trimmed later. As for channels, the variable section sweeps might serve you better. This requires trims and merge features as well as rounds to sew everything back together. Before all is said and done, you will have a lot of features of different types to bring it all together. This certainly falls under the advanced Creo surfacing classification. Save often and if you suspect a serious corruption has occurred, backtrack to an earlier version. How much contour are you shooting for? If you are using Creo 2.0 full version, I've attached a reference file for some ideas. I am running the student version of Creo 2.0. How do you extend the edges of the surfaces and what would that do? The same goes for channels.. Regarding contours I "just" need the sketched curves seen on the mask in my previous curve to either offset out from the model or down into the model. The deepest offset into the model would be 4mm i think. The biggest offset out would be 2mm. 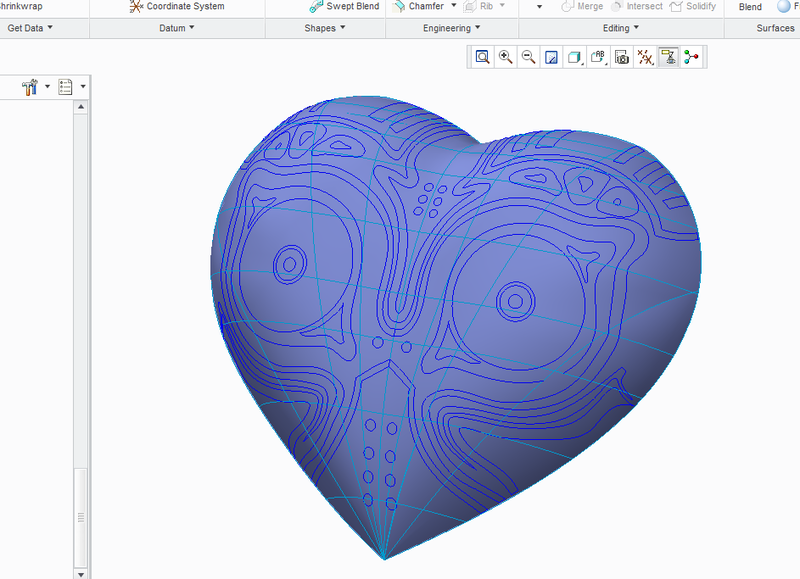 I tried remaking the Mask's surface by merging each of the small surface parts, but that only helped a few places (typically the flat areas without too many curves). Like I said before, you are embarking on a significant task within Creo not that it can't be a rewarding experience. In my example above, I was able to offset the feature past the edge. Try extending the sketch somewhat past the edge and it should work. In my session, the curvy "D" was first offset into the part and I used the edges to create a new surface with a variable section sweep. This new raised surface was merged with the original. The dots in the curvy "D" were done with an offset and rounds were used to clean up the edges. Every feature is its own challenge. By no means is the few techniques I just defined as the only methods. Every surfacing tool is at your disposal. How to best use them is up to you. I will add that you want your master furface to be clean. I see a wrinkle in there you may want to address (left center). I suggest the master quilt (surface) is a single feature so that your manipulation is not interupted. As you get more intricate with your features, you will want a very stable base to apply your new features to.